Climbing parks are great for body and soul. First and foremost, they offer tons of fun. Today the season starts at Oslo Summer Park, one park among dozens that have opened all over Norway in recent years. Climbing parks are genius. Besides being great for working out, they offer tons of adrenaline and childlike joy. In recent years, dozens of the parks have opened all around Norway. They’re full of hurdles, ladders, nets and swing bridges, zip lines and challenging, lofty trails that at places reach more than 20 meters up in the trees. Equipped with a climbing harness and helmet you’ll be safe, yet tense and excited. “It’s a super activity, where you can push your limits for height, balance and strength. When you do it right, it’s completely safe – and everyone does it right. It’s very easy to be safe here,” says Espen Bengston to Visit Norway. He’s the managing director at Oslo Summer Park, which opened for the season today. 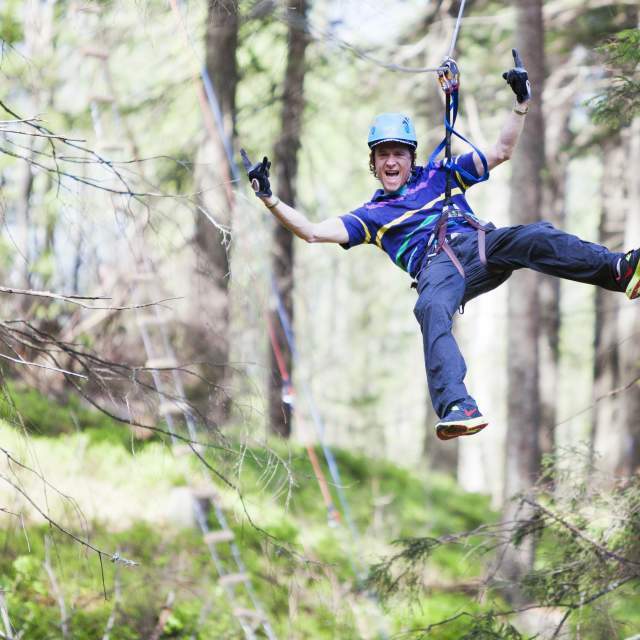 Beside a lot of other activities, they have a big climbing park, located just 20 minutes from downtown Oslo. It opens today for its fifth year. “We have nine courses with 150 elements, and will expand with three new courses toward the middle of summer. All of them are really fun, with various levels of difficulty,” says Bengston. The park is open to all, but there are restrictions based on age and height. Are you not going to Oslo? No worries – there are dozens of other options all around the country. You can explore your options below.